The Port of Cleveland is the first international cargo port located on the Great Lakes, responsible for handling more than 13 million tons of cargo annually. Due to its strategic location along the shores of Cleveland, the port is centralized to major Midwest markets including Cincinnati, Columbus, Pittsburgh, Indianapolis and Chicago. From limestone deposits to wind-energy components, the Port of Cleveland is an epicenter when it comes to international and domestic trade and distribution. 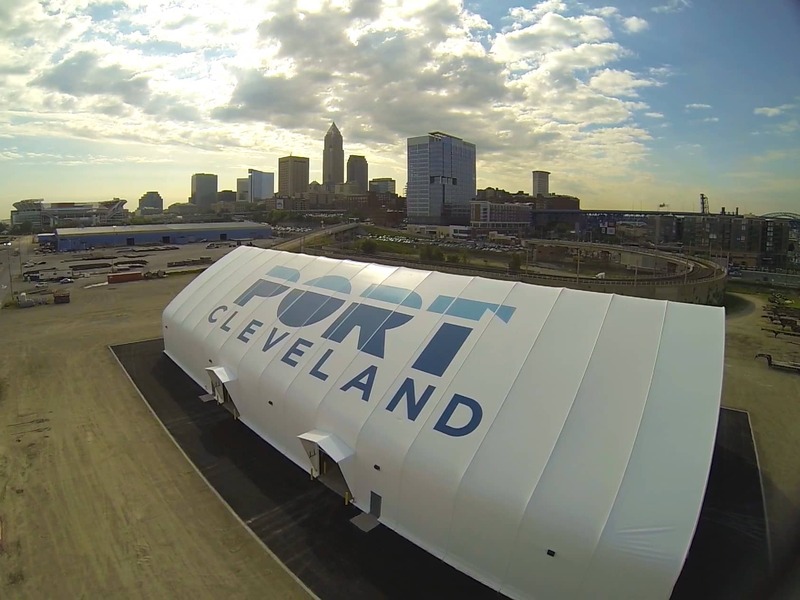 Cleveland’s notorious winters along with gale force winds from Lake Erie make having a durable fabric structure crucial to protect goods and equipment for many years. “We expect this building to be here for at least 20 years,” said Dave Gutheil, VP of Maritime and Logistics at the Port of Cleveland. “We are extremely happy with how it looks.” Seaman Corporation’s Shelter-Rite Architectural Fabrics are enhanced with a unique top coat finish that resists colorfastness after years of harsh UV exposure. This is important when it comes to placing a logo on the material for branding and aesthetics, as in the case of the Port of Cleveland. For over 40 years, Shelter-Rite® architectural fabrics have been engineered with a proprietary coating formula for superior UV and mildew resistance, and unique weft inserted knit fabric that provides excellent tensile, tear and seam strength. This time-tested technology has resulted in architectural structures that maintain long-lasting aesthetics.